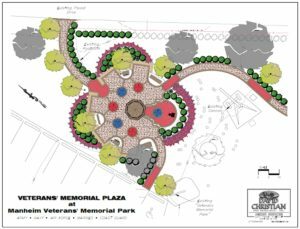 Support the Veterans Memorial Plaza at the Manheim Veterans Memorial Park by buying a commemorative brick that will be laid in plaza. This unique and timeless opportunity for recognizing individuals, show support from schools, sports teams or businesses with a brick, featuring a personalized message or name. It’s a lasting opportunity to help the Manheim community with a gift that is striking in its beauty and uniquely able to stand the test of time. One letter / symbol / space in the lines below. If ordering more than one brick, please fill out another order form. Orders will not be processed without payment. Installation time may vary due to brick sales. You will be contacted if a change is required in your requested inscription. Brick placement will be random.